Bottom Line: Don't let the funky shape fool you. This sucker's feature-packed and has the gusto to take on some of the lower-end big iron. Don't let the funky shape fool you. This sucker's feature-packed and has the gusto to take on some of the lower-end big iron. I'd like to say that I've got a pretty decent home network situation set up. I have DSL and about eight or nine nodes that need connections at any given time - My Trustix firewall, my Red Hat fileserver, my development workstation, my girlfriend's gaming system, a laser printer and print server, a laptop and living room hub for guests to plug in, and my Dreamcast (and soon my GameCube). Needless to say, I have a wide variety of devices with different needs, and different connection requirements for each. I also do IT administration for the local offices of a rather large company, and so at that location, I require flexibility, security, and having remote administration capability would be nice too. None of the locations I service have more than 15 connections each, so I'm not looking for big-iron devices or a rackmount system. We're also looking at implementing Virtual Private Networking (VPN) in the future too. Up until I received the Nexland Pro400, I'd been running my own hobbled-together server at home, and I was using a Netgear FV318 broadband router at the office. 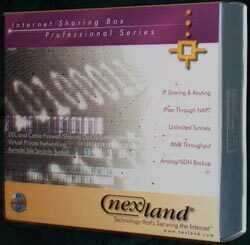 Then, Nexland offered to send me a trial of their Pro400 Internet Security Appliance, and I was eager to check it out.